It seems that our Hyderabad term is passing more quickly than a speeding auto rickshaw, as our eight-day weXplore excursion to the northern and central regions of India is already upon us. The trip presents an opportunity for our students to visit some of India’s most famous monuments and landmarks while also embedding themselves within the surrounding culture. In doing so, they can engage with the back-stories, critical issues and on-going debates connected with these places. Students will have a chance to witness the pageantry and spectacle of the flag-lowering ceremony held each evening at the Wagah land border post. A geographical overview of the areas north and south of the Vindhya mountains, and in particular the Punjab region: An emphasis was placed on the fertility of the Punjab region and how it has played a large role in all chapters of Indian history, from ancient times through the assassination of Mahatma Gandhi. Urbanization and its adverse effects on the prehistoric rock caves of Bhimbetka and the deteriorating Yamuna River, which crosses several Indian states, were also examined. The caste system in India — An overview of the caste system was given, so that students are better able to understand Sikhism, which challenged Brahminism and caste hierarchies. This also underlines why the concept of “service” in Sikhism was such a groundbreaking idea. The Green Revolution and its implications –- important for better understanding the situation in Punjab. India-Pakistan — a brief overview necessary for discussions on the Partition of India and our visit to the Indo-Pak border. Monuments and living history — should we preserve old buildings and linkages to a past that may have been oppressive? Why? Why not? Over the course of our eight-day journey we will split our time among four cities, all of which boast a population of 1 million or more and offer a variety of manners in which to revisit their dense history. 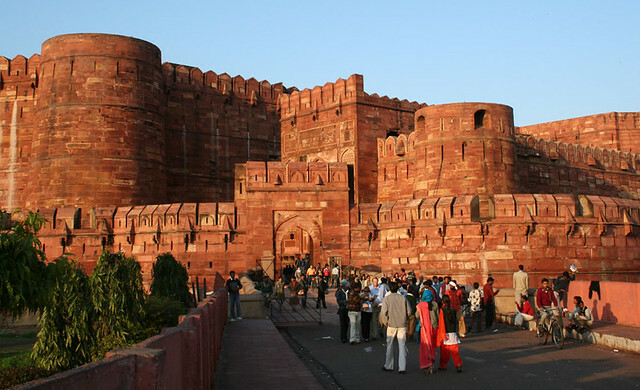 These cities are Amritsar, Agra, Bhopal, and New Dehli. In New Dehli, a particular focus will be placed on giving the students a sense of the continuity of the city through the ages, leading up to a discussion on urban heritage and preserving living monuments. As mentioned above, the issue of urbanization and its effects on the Yamuna river will also be taken up. We look forward to sharing with you our students’ stories and media from the road in the near future!